The injury crisis has hit Arsenal once again, as it was bound to. The current one takes place in the defensive department, and specifically at full-back. Andrew Thompson here puts a positive perspective on the issue. It’s the same storyline at Arsenal year after year, isn’t it? Surely there is no club in all of football that has a penchant for the injury bug like our beloved Gunners. When summer signing Mathieu Debuchy went down injured in the 2-2 draw with Manchester City just a week and a half ago, it threw everyone for a loop. Now that it is confirmed that the player is out for three months after successfully having surgery, our first-choice right back and replacement for Bacary Sagna will be missing roughly until Christmas, will miss the majority of our Champions League group stage campaign, as well as two key Premier League fixtures against Tottenham and Chelsea. But what if I told you that the injury suffered by the French international could only accelerate the timetable of the inevitable? Right up until the very moment of his injury, Debuchy was arguably Arsenal’s best performer overall, and certainly the summer signing to settle the quickest. Tasked with a role that is identical to his duties for the French national team as well as during his days at Newcastle United and LOSC Lille, the way in which the man from Fretin had flawlessly slotted into the first-team was key to keeping our chemistry and understanding at the back in the wake of the loss of such an important defensive stalwart. But despite Debuchy’s summer capture, Arsene Wenger made two other defensive decisions; the signing of highly rated Calum Chambers from Southampton, and the fast-tracking of Hector Bellerin to the first team. Chambers has impressed in the Community Shield win over Manchester City as well as in the Premier League and Champions League (nine appearances thus far in total), while Bellerin made his first major appearance for the club in the 2-0 loss to Dortmund a week ago. Even though the loss of such a key figure in Debuchy was hard to swallow, there is light at the end of the tunnel. No matter how talented and highly touted a young player might be, all of that promise will never rise to the surface unless he plays – there is no progression without significant time on the pitch. When Bacary Sagna opted to swap the Emirates for the Etihad, Arsenal were linked with many a right back, perhaps none more so than Serge Aurier. Powerful, quick, versatile and excellent going forward, the Ivorian international seemed the ideal long-term investment for the club. Now on loan at PSG instead, Arsene Wenger decided to land on Debuchy, the man who kept Sagna out of the France XI in the summer; but it is likely that Le Prof’s thinking was deeper than what lay on the surface. With Debuchy already at the age of 29, and Wenger’s history of being cautious when it comes to contract negotiations with players above the age of 30, it is entirely plausible that Bellerin was always in his long term plans. The addition of Chambers on the books left Arsenal in an excellent position in terms of their defensive picture down the road. Although the club is struggling for depth at current, the injury to Debuchy forces the young pair into the first-team picture for the foreseeable future, and that is anything but a disaster. Chambers came to the club surrounded by massive amounts of hype from many a Southampton supporter. The academy product, one of many in a long line of talented youngsters to come out of the south coast pipeline, was seen as the future at defense for the Saints. Had he not joined Arsenal this summer, Chambers would be second choice and deputy to Nathaniel Clyne rather than now being first-choice for the Gunners due to Debuchy’s absence. As for Bellerin, he’s impressed for Arsenal at youth level, but his lack of first team experience (where Chambers trumps him on) means that he is likely to only feature at right-back when Chambers is either rested or if the England man slots into central defense as a result of further injury issues, and possibly if either Laurent Koscielny or Per Mertesacker are in need of a day off. The Spanish youth international could also end up seeing time at left back – with Nacho Monreal out for a month, and Kieran Gibbs’ habit of spending time on the treatment table, the Barcelona born speedster could still have his time in the sun. What is important now, is that these players will be playing. Had Debuchy not been injured, Chambers would be playing second fiddle at any position across the back line, and Bellerin would see little time at all unless it came by way of the domestic cup front (and even that possibility has ended now). Debuchy may be crocked, but there will never be a better time for some of our youngsters to contribute significantly to the first team, which is something we often times struggle with. 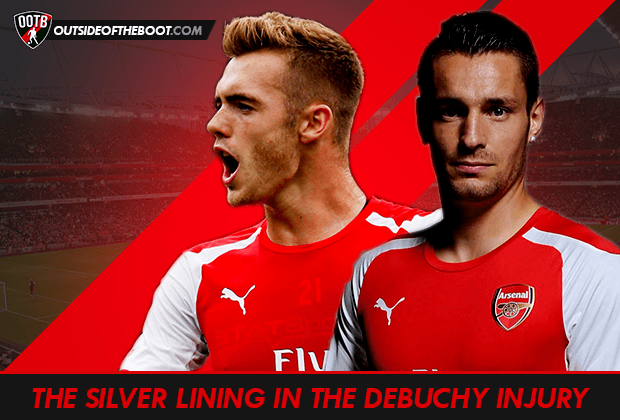 Who is truly the best option to replace Debuchy? As stated earlier, Chambers has more first team experience than Bellerin, and is now a full England international. However, when he first came to the club, Wenger talked the player up as a long-term solution at holding midfielder. When Per Mertesacker was in need of an extended time away from the first-team after winning the World Cup with Germany this summer, Chambers featured brilliantly at center back against Manchester City, Crystal Palace, Everton, Leicester City and Besiktas. Though he came to the club as a right back, Chambers has shone in the center of defense along side Koscielny. After an impressive performance against Benfica in the Emirates Cup, Bellerin showed precisely what he would bring to the table for the club – bags of pace, willingness to get forward, the ability to play a decent ball into dangerous areas, and the offensive wherewithal to overlap our right-wingers who love to tuck in centrally. Against Dortmund he was caught out plenty, and while must shoulder partial responsibility, the bulk of the blame must fall on Wenger’s tactics on the day, failing to recognize that asking his full-backs to play so high up and get too involved in the attack would spell disaster against a side with the pace and counter-attacking ability that Dortmund have in abundance. It was a tough pill to swallow for the youngster, but a valuable lesson that needed to be learned. Moving forward, most (myself included) would throw their weight behind Chambers as the obvious choice, but if there was ever a time where Wenger needed to learn the fine art of squad rotation, it would be here and now. As it stands, only Koscielny, Mertesacker, Gibbs, Chambers, Bellerin and Isaac Hayden are the defensive options for the club at least until Monreal comes back towards the end of next month. With tough fixtures coming thick and fast, player freshness will be paramount to not only avoiding a bigger injury crisis, but also allowing players to rest mentally. While there is no question that the loss of a player of Debuchy’s quality is regrettable, young players of promise undoubtedly deserve a chance to prove themselves. In the case of Calum Chambers and Hector Bellerin, these three months could end up being 90-days that potentially define their career, and the club will only stand to benefit from it. DEBATE: Is Social Media enhancing Knee-Jerk reactions and Glory-Hunting among football supporters?